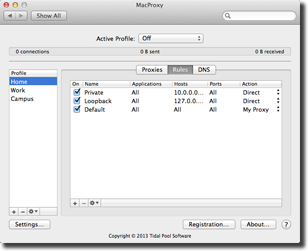 MacProxy provides system-wide network proxy support for the Mac. It forwards network traffic from applications that do not support proxies and avoids complex setup for applications that do. MacProxy allows you to surf the internet from behind a firewall, connect securely when using public WiFi networks, and navigate the internet without being tracked. Create profiles which include proxies, rules, and DNS settings. Profiles may be imported and exported (XML) so they can be shared with others. MacProxy supports a variety of SOCKS and HTTP proxy protocols, integrated SSH tunnel support, and proxy chains. Add rules that specify which proxy to use, connect directly, or block the connection. 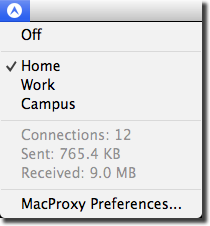 MacProxy provides a simple and intuitive user interface via a menubar menulet control and a System Preferences pane. Use the menulet to quickly change the active profile and check the current status. Mac OS X 10.12 or later. Download MacProxy 3.0.10 (2.3 MB). 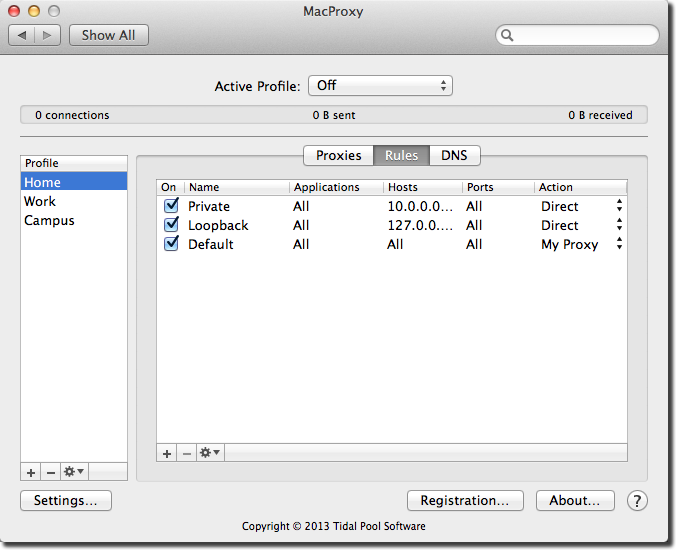 MacProxy includes a free, fully functional, 30 day trial. MacProxy 3 is a paid upgrade for 1.x and 2.x users. If you purchased MacProxy on or after June 1, 2013, you are entitled to a free upgrade to MacProxy 3. All other registered MacProxy users may purchase an upgrade for $19.99 (50% off).